Eileen O'Finlan was born in November of 1963 in Springfield, Massachusetts and has lived in New England all her life. Both of her parents were born and raised in Vermont, which Eileen considers her home-away-from-home. Growing up in a history-loving family where dinner conversation often revolved around the American Revolution or the Peloponnesian War, it’s not surprising that she went on to earn a Bachelor’s Degree in History. She also holds a Master’s Degree in Pastoral Ministry. A former long time member of the Worcester Writers Workshop, Eileen now facilitates a writing workshop from her home in central Massachusetts. She lives with her 91 year old mother for whom she cares and her two adorable and rather spoiled cats, Smokey and Autumn Amelia. Eileen loves to weave stories of historical fiction with strong, but very human, characters who prevail against the odds. Fascinated by the unusual and little-known aspects of history her goal is to create a magical experience for readers in which they encounter the unexpected. Eileen attributes her interest in the paranormal, which also makes its appearance in her writing, to the facts that she lived in a haunted house at a very young age and that she has a deep Celtic spirituality. Kelegeen by Eileen O’Finlan is a wonderful story, a tale of a people and a place in trying times. It is Ireland in 1846 and while engaged couple Meg O’Connor and Rory Quinn are happily preparing for their wedding, while they join other villagers in the moon dance, they are unaware that a painful scourge is about to hit the land. The people who depend on the soil for their livelihood wake up a few days after the moon dance to a horrible sight — their crops are being destroyed by blight. The people have known hunger, but this time it is something different. Meg and Rory work hard to find other ways of providing for their family, but tragedy and their own mistakes end their source of income. Only one way is left to save their families and Meg is ready to grab the opportunity, no matter how uncertain it seems: she will join the ship to America, and hopefully bring their families after. This is a compelling story filled with emotion, a beautiful story beautifully told. It features memorable characters like Father O’Malley and the British Doctor, Martin Parker. The author captures the culture of the Irish people with skill, creating a setting that readers can easily visualize. The writing is confident and gorgeous, filled with wonderful descriptions and dialogues. Eileen O’Finlan has a gift for plot and character and readers feel the sense of despair in the community and Meg’s resolve to find solutions. The conflict is introduced from the moment the villagers discover the blight and how the lives of the characters are changed irreversibly. Kelegeen features themes of love, family, friendship, and survival. It is a gripping story that is suspenseful and hard to put down, filled with historical references and social commentaries that allow readers a glimpse of the Irish soul. 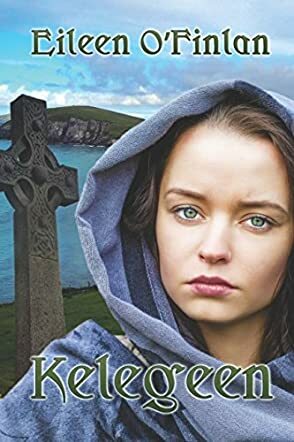 Kelegeen by Eileen O'Finlan is an historical novel set in the village of Kelegeen in Ireland during the potato famine. The parish priest, Father Brian O'Malley, teams up with a British doctor to assist the families of those affected by poverty and disease. They visit families in the village but words of comfort are often all they can offer. A young couple, Meg and Rory, try to earn money through sewing and wood carving. However, Rory is badly injured and loses his income. Meg is strong and determined to get through the devastating tragedy that has befallen the village. She carves out a plan to board a ship to a new life in America. She hopes she will be able to organize the means for Rory and their two families to join her. Eileen O'Finlan paints a haunting and emotional tale of the struggles of ordinary people in the village of Kelegeen during the mid-1800s. The poverty depicted is tangible, the suffering endured extreme, and the loss of life absolutely shocking. At times I could almost feel the thick fog and smell the foul stench of the blackened potatoes which were lost due to blight. Kelegeen is a compelling and atmospheric book which contains an important story in Ireland's history. A sensitively written narrative of the horrors of famine will stun readers simply because it recounts the horrors of a true story. However, despite the unendurable suffering, the strength of the people does shine through and there was hope for many through emigration. Those who enjoy historical fiction should find this book an engrossing read. The potato famine is causing everyone in Kelegeen great hardships. Meg and Rory plan to be married but are forced to put it off in order to survive. The food is scarce, sickness and dying plague every household, and without the potato crop there is little or no money, leaving everyone to beg or steal for their next meal. Father O’Malley tries to be there for everyone, as does Dr. Parker, but there is little they can do. Each and every person must make sacrifices, watch their loved ones die, but they all pray and wait for better days. It is hardest on Meg because she is faced with a life altering plan that will surely change her life forever. Kelegeen by Eileen O'Finlan is sad, happy, loving, faithful and a really good book. I was transported back in time to the Potato Famine in Ireland and quickly became immersed in the story. Meg and Rory, their families, their priest and the neighbors jumped off the pages and became very real to me. There is much sadness in Kelegeen but also there is also much love, prayer and faithfulness. Eileen O'Finlan is a talented author who writes with vivid descriptions and creates very real and likable characters. I don’t know if there is going to be a follow-up, but I am hoping that I can once again visit with Meg and Rory and see where the future took them. This is a perfect read for all and especially those who enjoy historical events being brought to life. Kelegeen is a definite winner!